Jeannie Lewis (b. 1945) is widely acknowedged as one of our most accomplished, versatile and passionate vocal artists, and a performer whose work crosses many musical boundaries. Jeannie started her singing career on the Sydney folk and jazz circuit in the mid-1960's then moved into the rock scene in the early 70s, establishing a strong reputation through her dynamic performances and powerful interpretations of songs both on stage and on the outstanding recordings she made in those years. During the 80's and 90's she continued to develop and broaden her career, with roles in musical theatre and the unique one-woman cabaret shows that reflected her growing love of Latin music, and her commitment to the often-underrated role of women's voices in music. Jeannie can adapt her voice to a large and eclectic range of material -- folk, rock, blues, opera, torch songs, Broadway tunes, tango and jazz -- and she is recognised both here and overseas as a peerless interpreter, with a rare ability to make almost any material her own. By the time she left Sydney University in the late 60's, Jeannie had already begun her performing career on the Sydney folk scene, as well as singing with jazz groups, inlcuding The Ray Price Jazz Quintet, The Nat Oliver Jazz Band and The Alan Lee Jazz Quintet, and her first commercial recording was as vocalist on the Ray Price Jazz Quintet's album Spectrum, released in 1971. On February 14, 1970 Jeannie made her one of her first major public appearances as a 'rock' performer. With the progressive band Tully (who had just finished their stint as house band for the Australian production of HAIR) and the Sydney Symphony Orchestra, Jeannie collaborated in the Sydney Proms premiere performance of Peter Sculthorpe's innovative work Love 200, with lighting and effects by the legendary Ellis D. Fogg (Roger Foley). This ambitious work for two vocalists, rock group and orchestra featured a libretto by noted TV dramatist Tony Morphett (Dynasty, Certain Women) and was written to commemorate the Captain Cook bicentennial. As the title implies, it explored themes of Captain Cook's journey to plot the transit of Venus in 1770 -- the voyage that led to his "discovery" of Australia. The meeting with Tully was the beginning of a long and fruitful working relationship between Jeannie and members of that group, notably Michael Carlos, who became her musical director and composed much of her first album. Later in the year she put together the Sydney-based group Gypsy Train which included ex-Tully vocalist Terry Wilson, jazz pianist and noted session player Bobby Gebert (later a member of supergroup Duck), Kydric Shaw (guitar), John Helman (bass; ex-Levi Smith's Clefs) and Daryl McKenzie (drums). In 1972, Lewis sang the title song to Jim Sharman's debut feature film Shirley Thomson Versus The Aliens. In 1973 EMI issued Jeannie's classic debut album, Free Fall Through Featherless Flight, arranged and directed by Carlos. Its cover was designed by renowed Australian artist Martin Sharp whose first record designs were the classic psychedelic covers for Cream's Disraeli Gears and Wheels of Fire LP's). The superb list songs included some fine Australian compositions like Jeannie's inimitable renditions of Graham Lowndes' "Till Time Brings Change", Company Caine's "It's Up to You" and Billy Green's setting of the Dylan Thomas poem "Do Not Go Gentle" (which Billy revisited the following year with Doug Parkinson on vocals, for the soundtrack of Sandy Harbutt's movie Stone). Other mtracks include Some Book of Life" (a collaboration between Patrick Flynn and Reg Livermore) and "It'll rise again", an excerpt from Love 200, co-written by Peter Sculthorpe and Tony Morphett. Backing Jeannie on the album was an all-star lineup including Michael Carlos on Moog, organ and harpsichord, Mike Wade and Mike Reid (guitars), Ken Firth (bass; ex-Tully), Jamie McKinley (ex-Cool Bananas, piano), Greg Henson (drums), Alan Lee (percussion), Marcia Hines (backing vocals), Shayna Stewart (backing vocals, ex-Extradition, Tully), The Fidelio String Quartet and a wind section. The album won the Australian Radio Record Award for the Best Australian LP of 1974, despite receiving virtually no radio support whatsoever outside the ABC, although it was featured on Chris Winter's pioneering show Room To Move, and gained further airplay in the early days of radio station 2JJ (Double Jay) in Sydney. Also in 1973, n 1973, Jeannie joined with The Alan Lee Quartet to participated in a series of ground-breaking jazz concerts in Melbourne's National Gallery of Victoria. Alan Lee, one of the great innovators of Aussie jazz, was inspired by great composers of the 20th Century, and he adapted works by Stravinski, Faure, Rodrigo, Villa-Llobos and Cantaloube for his small jazz ensemble. His sensitive treatment of these great masterpieces not only did them justice, they also brought these important works to the attention of a new generation. Fortunately, recordings were made at these concerts and some survived; these have now been released on the CD The Alan Lee Quartet and Friends: The Gallery Concerts 1973. Jeannie's second album was the live-set Looking Backwards to Tomorrow (In and Out of Concert), featuring another wide-ranging set of material, included her versions of Ray Davies "Celluloid Heroes" (also covered a couple of years later by Reg Livermore in Betty Blokk Buster Follies), Dory Previn's "Scared to Be Alone", Stephen Sondheim's droll "Ladies Who Lunch", another powerful Graham Lowndes song, "The House is Burning", and the Reverend Gary Davis' "Cocaine Blues", on which Jeannie was backed by The Foreday Riders. "Celluloid Heroes" b/w "Rocelli Kaharunta" was issued as a single, and the American label Mainstream released the album in the USA. Jeannie's next record was an ambitious double-album set Tears of Steel & The Clowning Calaveras (1976) which recreated her famous series of concerts held in November 1975. She drew the initial inspiration for the project from the poem Tears of Steel by Chilean writer Pablo Neruda, and from the 'Day of the Dead' ceremony, held annually in Mexico on the Catholic feast of All Soul's Day. This unique festival, in which people parade with `calaveras' (mock skeletons) in "a burlesque parody of life and death", is ostensibly a Catholic riutal, but is in fact a remnant of ancient pre-Columbian Aztec ceremonies. Again, Lewis and musical director Carlos put together an powerful and eclectic set of songs, including Phil Ochs' "The Crucifixion", Graham Lowndes' "Rising of the Tide", the Jimmy Webb classic "The Moon's a Harsh Mistress", The Fugs' "When the Mode of the Music Changes", Bowie's "All the Madmen" and Dory Previn's "The Game". The concerts and album were the first obvious sign of Jeannie's burgeoning interest in Latin American music and culture, and in late '75 she was became one of the first 'popular' performers to be awarded a grant from the Australia Arts Council to study overseas. Another notable grantee that year was former Country Radio leader Greg Quill. Thanks to the grant, Jeannie was able to spend two years in South and Central America, where she immersed herself the music, culture and politics of the region. She returned in late 1978, and one of her first major appearances after her return was supporting John McLaughlin on his Australian tour in July 1979. Her next stage show "Krazy for You" featured a typically diverse choice of material ranging from Nick Lowe and Bruce Springsteen to Noel Coward. In 1981, with actor/writer John Derum she created and starred in "Piaf, The Songs and the Story", their hugely successful tribute to the music and life of the legendary French singer Edith Piaf. The show received tremendous audience and critical acclaim in numerous seasons both in Australia and internationally, including Hong Kong. She also recorded an album of 15 songs from the show, "Piaf: the Songs and the Story" released in January 1982. (She had originally appeared in 1980 in the leading role in the Pam gems play "Piaf at the Comedy Theatre in Melbourne). Jeannie continued in musical theatre with a role in Weill's "Threepenny Opera" and in 1983 she presented a new show, "So U Want Blood", backed by 'The All Singing All Dancing Orchestra' -- Red Symons (guitar, musical director; ex-Skyhooks), Paul Grabowsky (piano), George Worontshak (keyboards), Ian McDonald (bass) and Eddie Van Roosendael (drums; ex-Stiletto). Larrikin/EMI issued the So U Want Blood soundtrack album, and the single Big Cliches (Are The Best) / Just One Spark was released in September. Jeannie continued presenting and writing her own acclaimed one-woman shows -- "For a Dancer", a show about the life and times of her mother, premiered at the1982 Adelaide Festival; "Voxy Lady: A History of Women's Voices" Adelaide premiere in 1990, and also a new cabaret show "Dangerous Lovers" (1992). As well as her own shows, Jeannie appeared in a 1984 theatrical production of Bizet's "Carmen" for the Melbourne Theatre Company, represented Australia at the Festival International Cervantino in Mexico (1987), sang in the Paul Robeson stage show "Deep Bells Ring" (1987), performed on the children's album Cinderella a Cappella album with Margret Roadknight, Moya Simpson and Blaire Greenberg (1994), and toured a revival of "Piaf" in 1996. In April 1995 EMI issued a CD version of the compilation of her 70's material, Classic Tracks 1973-76. In 1998 Jeannie appeared in "Love, Life, Death and the Weather" at the Performance Space with Patrick Harding-Irmer, Anka Frankenhauser and musician Steve Blau. 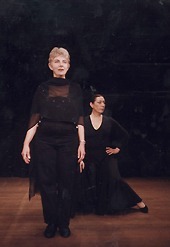 In November 1999 Jeannie collaborated with flamenco dancer Veronica Gillmer on the production "Camerino", at Sydney's Tom Mann Theatre. Can two divas share the same stage let alone a dressing room? Camerino brings together two of Sydney's veteran divas, Jeannie Lewis and Veronica Gillmer, under the direction of Jose Farinas. Developed from a work shown in 1998, the vision of this work goes back to 1980 when Lewis and Farinas met Gillmer after her jaw-dropping performance at the Cell Block Theatre, when the three first discussed the idea of working together. The collaboration brings together the women that Farinas says, "move me more than anyone else on the stage". His direction exposes the power and singularity of two highly experienced performers and their particular talents - the power, subtlely and wit of Lewis's voice, which draws on many different vocal traditions and the dignified stillness, mesmerising hands, elegance, easy humour and lithe charm of Gillmer's performance style. In January 2000 Jeannie joined in the cast of "One Word …We", Maurie Mulheron's musical biography of Pete Seeger, at the New Theatre, Newtown, Sydney, and later at the Woodford Folk Festival 2001. She was a special guest performer at the Sydney Cabaret Convention 2001. It's a pleasure to end this brief review of Jeannie's remarkable career by noting that in May 2001 she received a wonderful accolade in the form of an $80,000 Fellowship grant from the Australia Council. The Fellowships provide financial support for two years to enable artists to dedicate time to creative work and professional development. Jeannie will use her Fellowship develop a new collaborative project, Southeart, "inspired by the tango Corazon al Sur and the similarities between the Southern lands of Australia and Argentina", and she will also continue her work on a semi-autobiographical anthology of short stories, poems and songs. Lewis believes her projects "will ensure that Australian music continues to explore its own voice." 3. "Porque Los Pobres No Tienen"
1. "Putting on the Mask" / "Rising of the Tide"
3. "The Moon's a Harsh Mistress"
1. "Swimming Song" / "Not Waving but Drowning"
3. "Chile Stadium" / "Te Recuerdo, Amanda"
5. "When the Mode of the Music Changes"
1. "Bravo Pour Le Clown" / "Biem"
2. "Tears of Sorrow, of Source"
Musicians: Denni, Creenagh St. Claire, Bridget O'Donaghue, Greg Bond, Nick Lathouris, Lex Marinos, Ted Robinson, Howard Eynon, Nick Armstrong, Wayne Finlay, Dave Ellis, Doug Gallacher, Rick Miller, Roger Frampton, Brian Godden, Mike Reid, Michael Carlos, Andrew Simon. 1. "Only Time Will Tell Me"
4. (a) "Carlos Castenada Quote" (b) "Do No Go Gentle"
"La Mome De La Cloche"
"La Goualante Du Pauvre Jean"
"Le Gitane Et La Fille"
4. "Don't Hold Your Breath"
6. "Big Cliches (Are The Best)"
4. "Reason For It All"
Musicians: Red Symons (guitar, musical director), Paul Grabowsky (piano), George Worontshak (keyboards), Ian McDonald (bass) and Eddie Van Roosendael (drums). "Fasten Your Wings With Love"
"What Have They Done To The Rain?" "Ballad For A Crazy Person"
"Nail You To The Cross"
The songs and story of Pete Seeger and friends, a musical biography by Maurie Mulheron. Recorded live at New Theatre Sydney January 29, 2000.